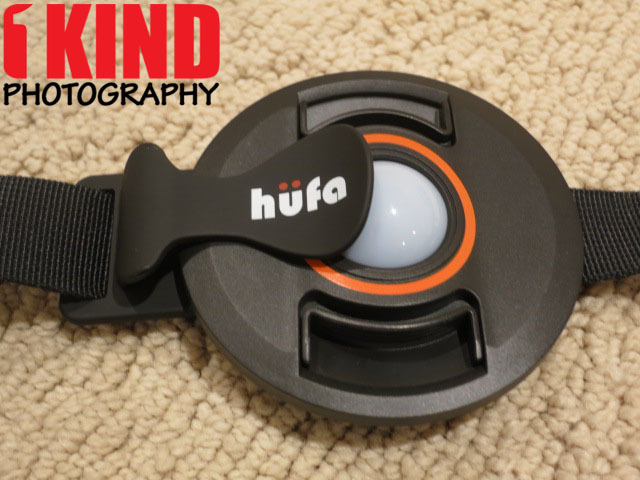 Overview : The Hufa S Holder Lens Cap Clip is the perfect accessory for all DSLR photographers. It fits an endless variety of lens caps, keeping the cap close to the lens and user at all times. 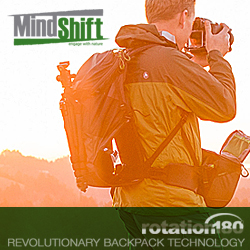 It can connect to all types of camera neck straps (up to 1-inch wide), and is ideal for sling-style straps. 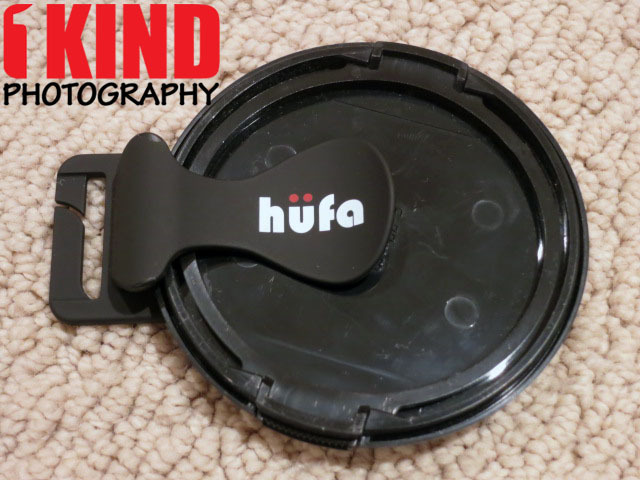 Quality/Usability : We previously reviewed the Hufa Holder The Original Lens Cap Clip a while back. 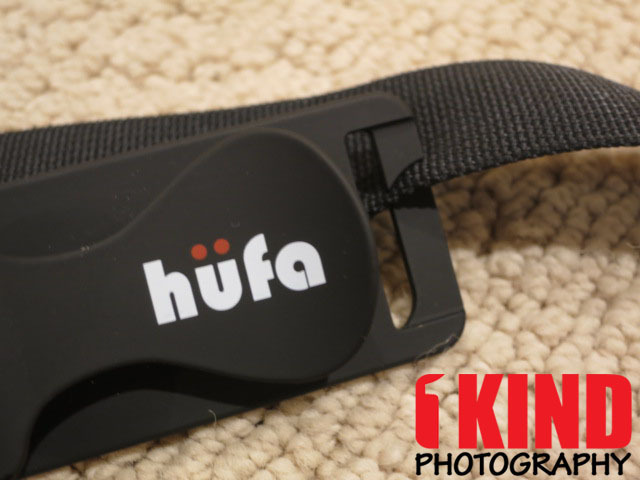 While the original Hufa Holder was ideal for regular camera straps that went around your neck, it worked OK for sling straps but wasn't designed specifically for it. 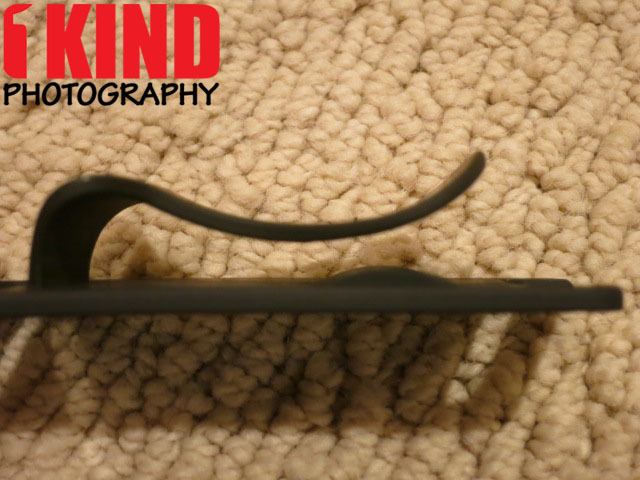 As you can see from the image above, you'll notice all the extra space where the strap loops through which would cause the Hufa Holder to either slide around or even accidentally fall out. 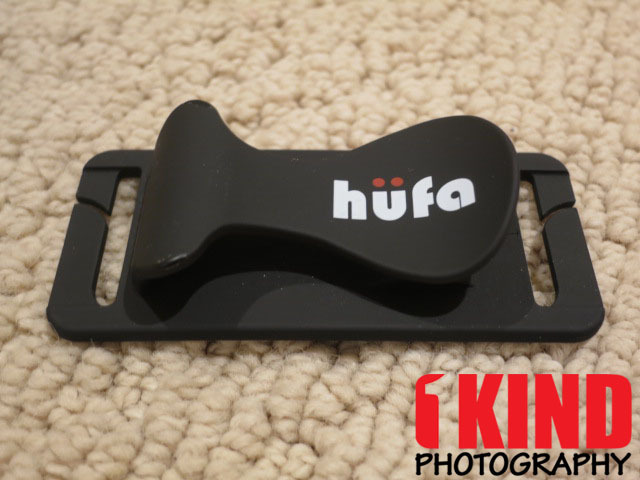 Hufa has released a new version of the Hufa Holder that is more ideal for sling straps called Hufa S. It comes in three colors: red, black and white. 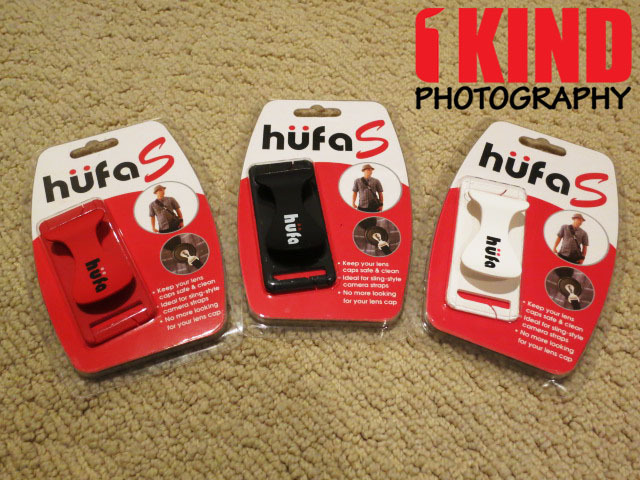 The look of the Hufa S looks similar to that of the Hufa Holder but the S has more of a vertical design and attaches the length of the strap rather than the width. It's made of the same durable plastic material. 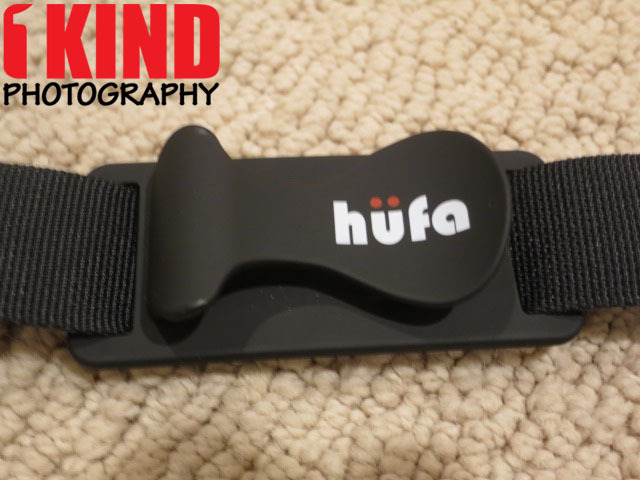 Hufa uses the BlackRapid straps as demonstration to show that it works so why show the same thing? It's best if we showed the Hufa S being used on a different strap other than BlackRapid. 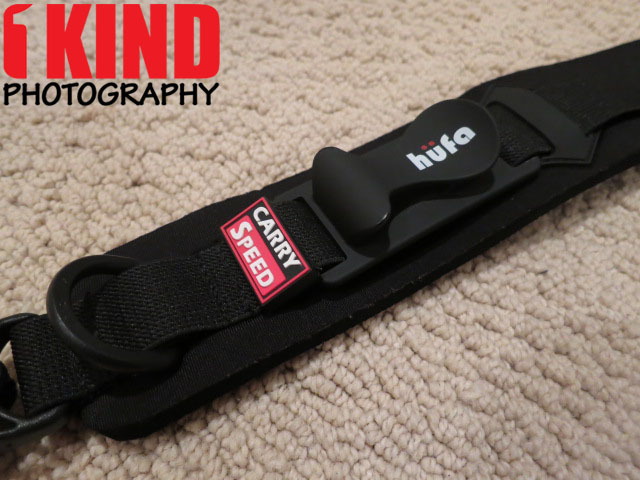 Since we have a Carry Speed strap laying around, we'll be using that to demo the Hufa S.
Installation is fairly simple and the same as the original. Simply slide the nylon strap through the opening of the Hufa S until the nylon is fully through. You'll do this to both sides of the Hufa S.
As you can see from the picture above, the Hufa S fits perfectly on the nylon strap that is no more than 1" wide. I don't think there are any sling straps where the nylon strap is more than 1" wide. Once it's on the strap, the Hufa S won't slide up or down unless you purposely move it with force. 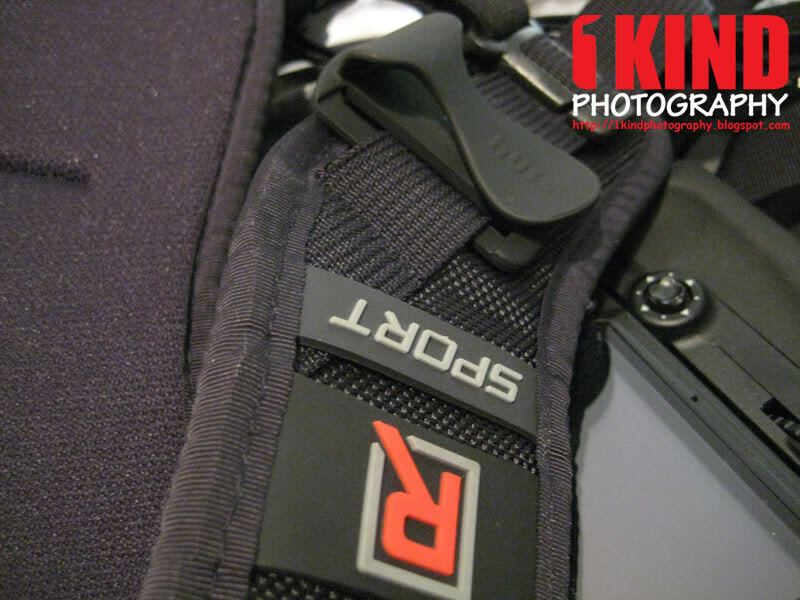 In the third image, we moved the Hufa S towards the shoulder strap so that it doesn't get in the way of the camera. Even though it may look and do the same as the original, there does seem to be a small update to the design other than it being vertical. 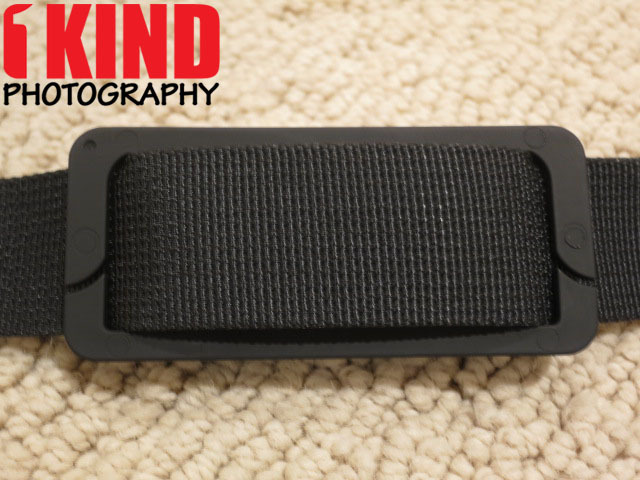 This new hump addition may also apply to the original Hufa Holder and it does make the lens cap more secure. There is no size limit that the Hufa S can hold. 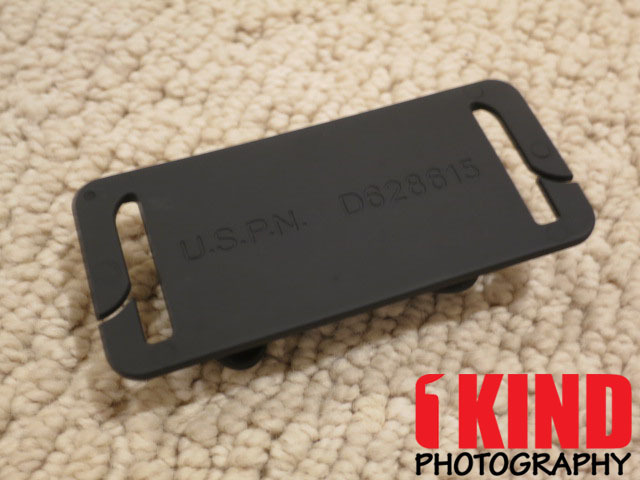 Whether its 52mm or 82mm, it will hold the lens cap without a problem. It doesn't matter which way the lens cap is facing, it will still hold it securely. It even holds a white balance lens cap. 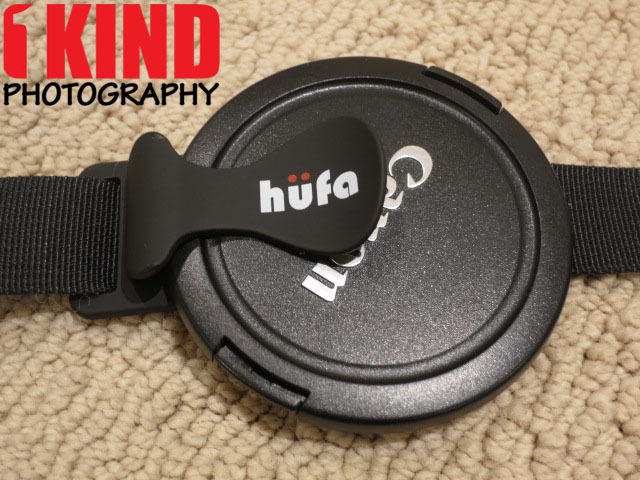 Conclusion : Overall, the Hufa S Holder Lens Cap Clip for Sling Straps is the better choice if you use a sling strap. The look and design is still similar/the same but I noticed the new hump on the inside which prevents the lens cap from falling off. I know there are some people out there questioning why buy a lens cap holder when you can place it in your pocket or just dump in your camera bag. There's also lint in your pocket as well as keys, loose change or don't even have a pocket at all (for you females). There were a few times where I sat on my lens cap and it wasn't comfortable. Some may not even care about their lens cap. Eye-Fi has made downloading digital camera photos onto mobile devices a lot easier. Eye-Fi users have been wirelessly transferring images from card to computer for some time now, but the new Eye-Fi Mobi card uses Wi-Fi to wirelessly send images to your mobile device via a iOS, Android or Kindle app. The Eye-Fi Mobi card functions as a normal SD card inside a digital camera. By entering the card's unique 10-digit code into the Eye-Fi app, users can download and transfer images to their mobile devices. Once the photos are on a smartphone or tablet, users can edit and share them as they would any mobile photo. Eye-Fi hopes that the new Mobi cards will mean easier DSLR photo uploading for mobile-only editing apps and photo-sharing social networks like Facebook, Instagram and Twitter. The new cards could also mean lighter traveling for photographers. Instead of hauling around a laptop, photographers can back-up photos to both their smartphone/tablet storage or to the cloud through the mobile device. For those users who prefer to edit their pictures on a computer Eye-Fi still offers the "traditional" Pro X2 16GB card, which offers wireless transfer to PC/Mac, RAW upload support and optional cloud backup. You can purchase Eye-Fi products from Amazon, B&H Photo and Adorama. MOUNTAIN VIEW, Calif., June 3, 2013 — Eye-Fi (www.eye.fi), the global leader in wireless memory cards, today launches Eye-Fi Mobi — the first card designed for the modern photo enthusiast to deliver high-quality digital photography combined with the convenience and connectivity of mobile devices. Mobi users can now share smarter, easier and faster, as their best photos and videos, from their favorite digital cameras, are instantly available on their smartphones or tablets. "People like smartphones for taking pictures, mostly because of accessibility and instant sharing. Unfortunately, smartphones fall short for life's many moments that require zooming, high-speed shooting, low light and other features that make digital cameras superior," said Matt DiMaria, CEO of Eye-Fi. "Mobi is our simplest card yet, designed to provide photo lovers a no-compromises solution: the great quality pictures and videos of a digital camera and instant access on the smartphone to enjoy and share." Mobi removes the hassle of transferring images so today's photographer can freely focus on taking beautiful, memorable photos. No more juggling devices, using a camera to capture quality images and then separately, taking similar, but inferior shots from a smartphone just to share. Simply replace any camera's standard SD card with Mobi, and just two quick steps later, the camera's photos instantly appear on the selected iOS or Android™ smartphone or tablet. "Our research shows that the capabilities of Eye-Fi's Mobi cards are bridging a market gap: a majority of digital camera users are expressing interest in wireless transfer to mobile devices," commented Alan Bullock, associate director of InfoTrends. "Even more compelling is the data that many consumers say they would likely use their digital camera more if it had such a feature." Editing and sharing photos are just as easy, because the higher quality images become part of the camera roll on the phone — ready for any favorite apps like Facebook, Instagram, Snapseed, Pixlr, and even a quick text or email. Any sharing, editing or display options people love about their phones and tablets are now easily used and enjoyed with their best photos and videos. "Until now, sharing high-quality camera pictures while traveling meant waiting until the end of the day, or worse, waiting until the end of the trip to get images off my camera," says Francesco Rovetta, an avid Eye-Fi user and founder of Summit Stories, a philanthropic mountaineering project that helps disadvantaged children. "But with the Mobi card, I can take great pictures from places as remote as Mount Kilimanjaro, while still getting the real-time editing, sharing and backup of my phone. This new card connects my phone and camera so I can share my passion for photography in a way that's convenient and fun again." Set up simply and instantly: The Mobi has the simplest Eye-Fi card setup yet — no computer, no account and no cloud. Just download the free Eye-Fi app for iOS or Android, enter the Mobi card's unique 10-digit code, and the mobile device is paired. Use the same code to pair as many mobile devices as needed. Share in real-time: High-resolution photos and videos instantly transfer from camera to a device's photo roll/gallery. From there, edit and share with any favorite apps. Transfer anywhere: Built-in WiFi means no WiFi network, hotspot or internet connection needed for pairing or transfer; Mobi literally captures photos and then copies them from camera to device anywhere, whenever new content is detected. Works with the devices users already own (and love): As with other Eye-Fi cards, Mobi works with thousands of cameras, including hundreds of Eye-Fi Connected cameras that have integrated Eye-Fi technology for improved usability. And, the Eye-Fi app can be downloaded for iOS and Android smartphones and tablets, including the Kindle Fire. Back up automatically: Photos and videos transfer as they're taken, so if anything happens to the camera, content is already safe on the mobile device. Exceptional quality and speed: Mobi reinforces Eye-Fi's commitment to provide state-of-the-art performance in SD memory. HD video, low light and fast action shots are easily captured with this Class 10, high-capacity card. Eye-Fi will continue to provide wireless solutions for professional and amateur photographers with the Eye-Fi Pro X2 16GB card, which has feature-rich capabilities like RAW upload support, wireless transfer to PC/Mac and optional integrated backup in the cloud. The Mobi card will retail for $49.99 for the 8GB card and $79.99 for the 16GB card and is available now on through www.eye.fi, Amazon and in Best Buy stores nationwide. For more information about the Mobi card or Eye-Fi products and services, please visit www.eye.fi. Today only, enjoy special savings on memory cards from SanDisk. This one-day offer is valid on June 3, 2013. B&H Photo has discounts on selected Sandisk memory cards. Amazon is also offering discounts on selected Sandisk memory cards – up to 60%.